False-colour image of RSL on slopes in Hale crater. The blue colour is thought not to be related to their formation, but instead are from the presence of the mineral pyroxene. The image is produced by draping an orthorectified (Infrared-Red-Blue/Green(IRB)) false colour image (ESP_030570_1440) on a Digital Terrain Model (DTM) of the same site produced by High Resolution Imaging Science Experiment (University of Arizona). Vertical exaggeration is 1.5. 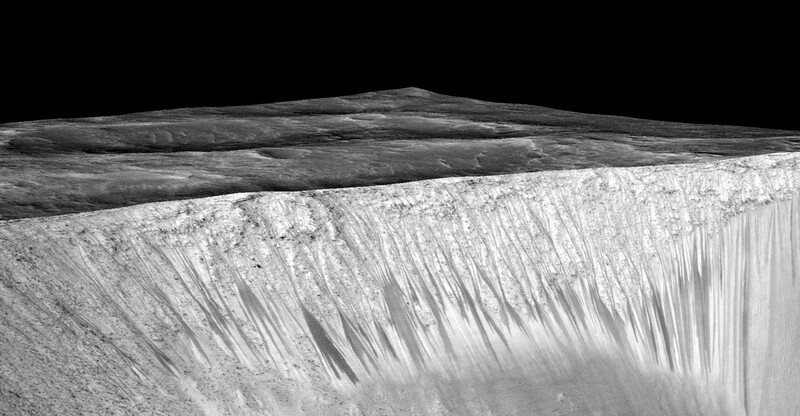 In a finding that is sure to fuel the ongoing debate about possible life on Mars, NASA announced yesterday the confirmation that intriguing seasonal dark streaks running down Sun-facing slopes are indeed flows of liquid water. The water is salty (briny), but just the fact that it is current liquid water, albeit transient and in relatively small amounts, is still big news. The findings, detailed in a new paper just published, come from the Compact Reconnaissance Imaging Spectrometre for Mars on board the Mars Reconnaissance Orbiter spacecraft (MRO). MRO has been examining the Recurring Slope Lineae (RSL) phenomenon on Mars for several years, and now the spacecraft has confirmed the existence of hydrated salts on RSL slopes from four different RSL locations on the planet. These salts would be leftover deposits from briny water which evaporates after being exposed on the surface for short periods of time. Fresh water would quickly sublimate into the atmosphere, since the atmospheric pressure and temperatures are too low for liquid water to normally remain long on the Martian surface. The RSL flows have been a mystery to planetary scientists for years now; they are long, dark, narrow features running down warmer, Sun-facing slopes on hills or in craters in the mid-latitudes and equatorial regions. MRO has observed them appearing repeatedly on an annual basis. After first appearing in times of warmer temperatures, they tend to fade over time as temperatures cool again, appearing like soil which becomes wet and then gradually dries out. Indeed, the leading hypothesis has been that they are temporary flows of briny liquid water, but confirming that has been difficult, until now. 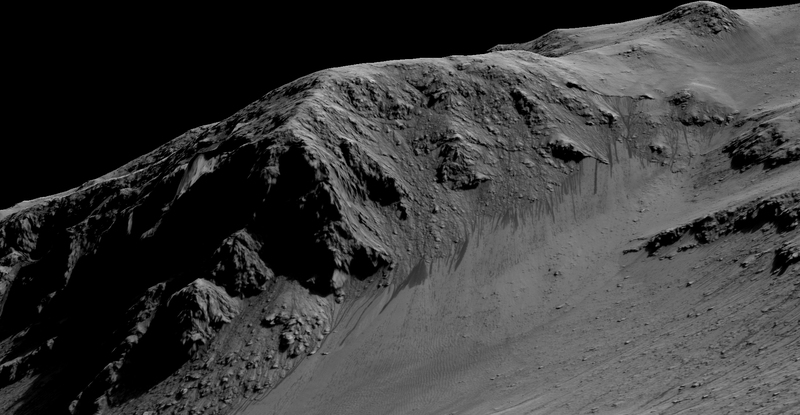 The flows are smaller amounts of water wetting the ground, rather than streams per se, but any liquid water seen in Mars’ hostile environment is an exciting discovery. The streaks are typically only a few metres wide, but can be several hundred metres long. Water had been the leading hypothesis to explain the RSL, but that couldn’t be proven until the chemical components of the dark streaks could be analyzed. “The salts are hydrated when we observe them,” Ojha noted. “What was missing was the chemical identity – until now,” he added. Perchlorate salts appear to be the primary salts involved with RSL; such salts have been found by other lander and rover missions to be very common on the Martian surface. The hydrated salts most consistent with the chemical signatures seen in RSL are most likely a mixture of magnesium perchlorate, magnesium chlorate, and sodium perchlorate. On Earth, percholrates can keep liquids from freezing even when conditions are as cold as -70 Celsius (-94 degrees Fahrenheit). The observations from MRO are also the first time that perchlorates have been identified from orbit. “The ability of MRO to observe for multiple Mars years with a payload able to see the fine detail of these features has enabled findings such as these: first identifying the puzzling seasonal streaks and now making a big step towards explaining what they are,” said Rich Zurek, MRO project scientist at NASA’s Jet Propulsion Laboratory (JPL) in Pasadena, Calif. The origin of the water, however, is still not well understood. The three leading theories are melting ice, atmospheric deliquescence by hygroscopic salts, and subsurface aquifers. However, all of them have problems. There is thought to not be enough subsurface ice in the equatorial regions to explain RSL in those locations. Atmospheric deliquescence by hygroscopic salts seems unlikely since there is an observed absence of concentrated deliquescent salts on the surface, and it is still unclear how the Martian atmosphere can sufficiently supply water vapor every year to create RSL. Aquifers could discharge to form the RSL, but RSL on the tops of local peaks are difficult to explain this way. It may turn out that there is more than one cause of RSL, in different regions under different conditions. From the many orbiter, lander, and rover missions it is now known that Mars used to have a lot more liquid water than it does today, with rivers, lakes, and maybe even oceans. 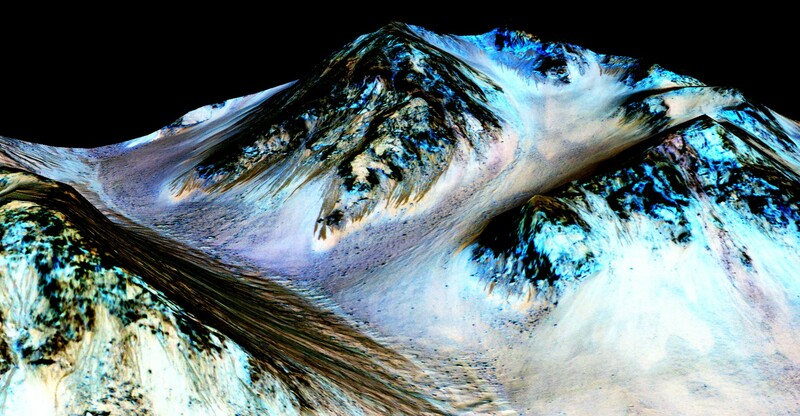 Yes, “water on Mars” has been in the news a lot the last few years, but today’s announcement is significant in that it deals with current liquid water, not just water in the remote past. Dark streaks seen on the slopes of Mount Sharp in Gale crater may also be RSL it was noted in the press conference, but that has not been confirmed yet, and if they are, it is still unknown whether the Curiosity rover could get close enough to study them. The finding of course also brings up the possibility of life (likely microbial at best). Does this increase the chances of current life? Perhaps. The water is very briny, so not the kind you would want to drink, but many microbes on Earth are quite happy living in similar briny water. 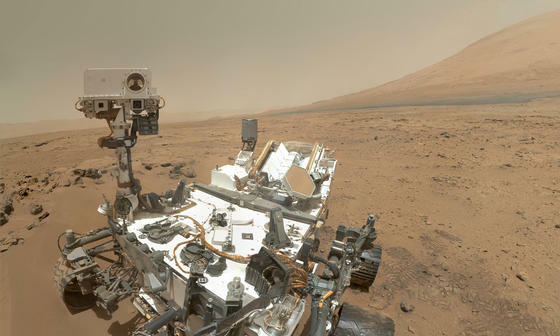 If life ever started on Mars, it could feasibly continue to survive in such conditions. If there are subsurface aquifers, that would be an exciting discovery, since they could potentially be more habitable than just short-lived flows of water on the surface. We just don’t know yet, and answering that next question will require much more study and exploration. “The chances of life in the subsurface are very high,” in the opinion of HiRISE Principal Investigator Alfred McEwen of the University of Arizona Lunar and Planetary Laboratory in Tucson, Ariz. Only with further investigation will we know if he is right. The press conference can be viewed on YouTube and more information about the Mars Reconnaissance Orbiter mission is here. This article was first posted on AmericaSpace.